About my Collection: For my Pokemon Plush collection, I'm looking mostly for plush that have a nice balance between accuracy and cuteness. I wish I could say that one company does this the best, but it really seems to depend on the Pokemon, how big the plush is, etc. Anyway! 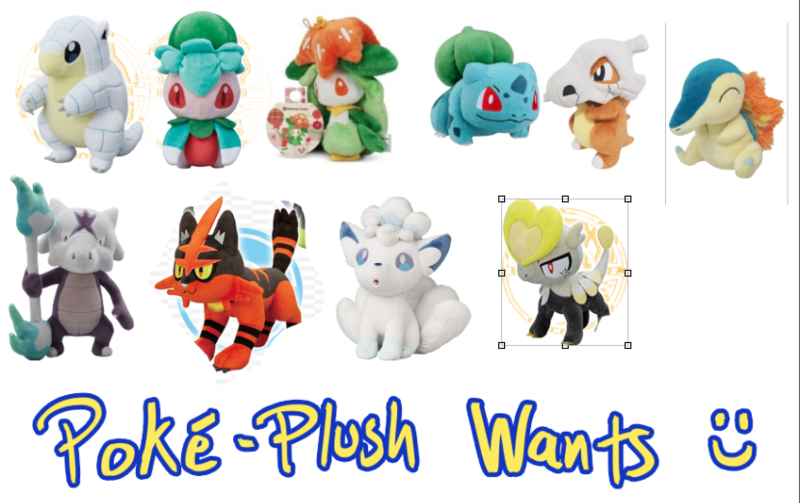 Here are the Pokemon plush I'm trying to track down. PM me or comment if you have one and would like to help me check them off the list. Also, I don't have a preference if there are US vs Japanese versions of the same plush, as long as they actually are the same. Disclaimer: I don't own the pictures I used for this, I just pulled them off google so there would be a visual next to my descriptions. So, this is a little livejournal post to prove that I'm a real person to any and all LJ communities I decide to join. I signed up through my Facebook so hopefully that also adds some authenticity and is an acceptable way of joining the LJ universe. About Me: I'm an artist and I write a little as well, though I probably won't be posting a ton of stuff here. I have a deviantart and I'm on Facebook if people want to contact me for commissions or just want to look at my art. I'm a huge nerd, I like most things Fantasy and Sci-Fi, and while I don't "game" a lot, I love the stories and experiences that gaming offers to the world and storytellers as a medium. I guess I'll do a quick little list of things I've been into lately in case it leads to someone suggesting a group on here to join. Pokemon, Steven Universe, Firefly, Mass Effect, D&D, Star Wars, Marvel, Disney, Ghibli Films, Cosplay, Magic, Legend of Korra, Painting, Drawing, Fiction, Wheel of Time, Cooking, Fitness, Capoeira.